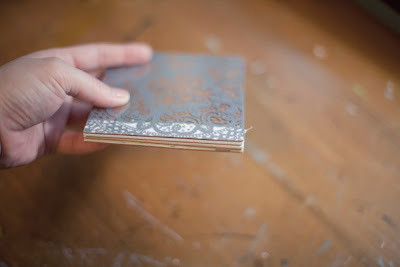 Here's really simple way of creating a mini book using Studio Calico's FabRips. I love this tape. 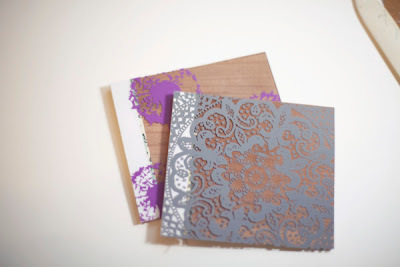 It's super durable and works really well for this project. 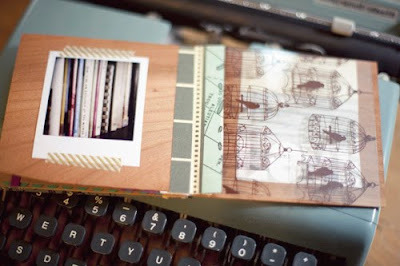 I made this book using July 2009 kit, Documentary. The camera stamp below can still be found in the shop. 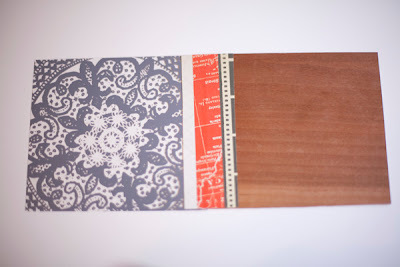 Today I'm going to demonstrate this binding technique using some wood veneer I had left over from a previous kit, Hambly overlays and the newest set of FabRips from the Documentary line which can be found at Two Peas. 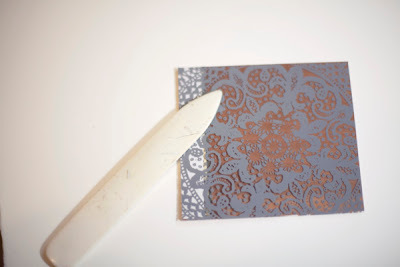 You'll also need your paper cutter or exacto knife, a ruler and a bone folder. Go ahead and cut your pieces to your desired size. 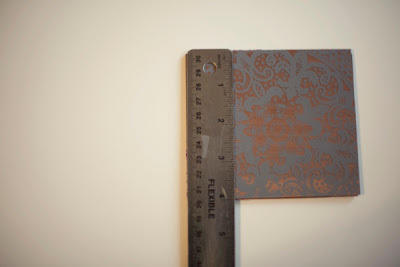 I chose to do a mini book measuring 4x5. I have a total of 4 pieces of wood and 4 pieces of the overlay. Measure the length of your book. This will determine the size of your FabRip pieces. Since mine measures 4 inches, I went a ahead and cut 4 inches of the FabRip paper. I chose to cut the FabRip the opposite direction for my outside binding piece so I could get a little of each design to show. 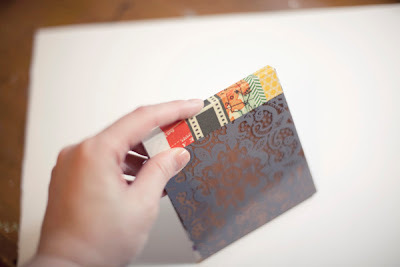 Depending on the thickness of your desired material (cardstock, chipboard) and how much of the binding (FabRip) you want to show, this will determine the width of your pieces. My pieces were about an inch wide, give or take an 1/8th or 2. Start with your first 2 sheets. Place them tightly side by side. 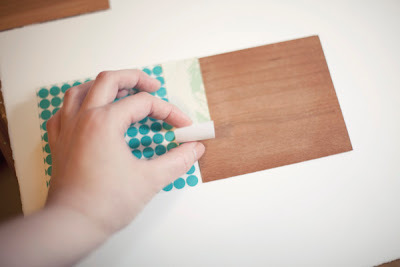 Take you cut piece of tape and center it between the 2 sheets. Stick it down and smooth out with your finger. This is where a bone folder comes in handy but it's not truly necessary. 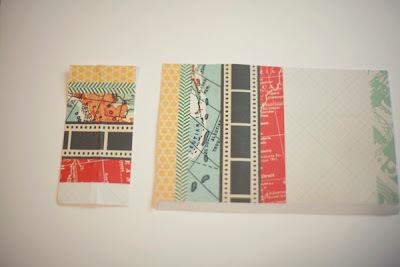 Fold the page and crease it down using either the bone folder or your finger. Set these attached pages aside. 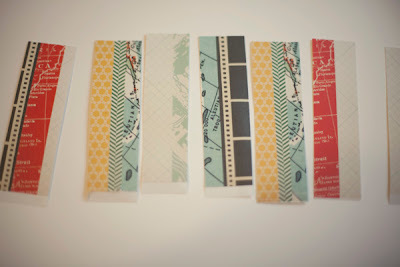 Move onto your next set of pages and repeat the binding process. My advice is work in pairs. This will ensure a more even binding. If you were to to bind 2 pages, then bind each single page from then on, it starts to get a bit wonky. Now I have 4 sets of binded pages. From here you want to bind the sets, again in pairs. Now you're down to 2. Almost there! 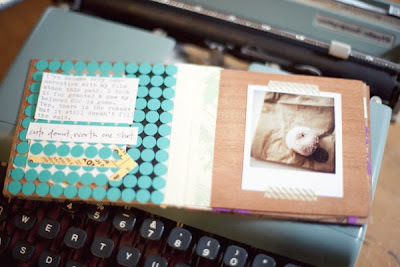 Bind the last 2 sets of pages. This is what is should look like from the side. Now to finish it off with the cover binding. This piece actually measures about 2 1/2". 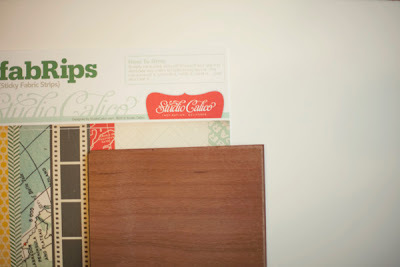 I would suggest taking the tape and wrapping it around the edge to form a crease before taking the backing off. 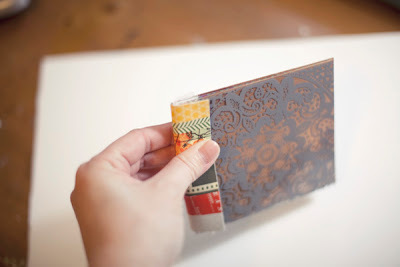 This will be a guideline when sticking it down and makie it easier to bind it evenly from front to back. Unpeel and stick making sure you crease it down nicely into the spine of the book. This tape sticks nicely and I've never had it come undone when flipping through the book. 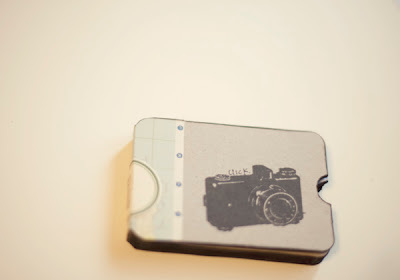 But if you unpeel and stick it back when you're trying to bind it, you'll compromise the stickiness of the FabRip. Not to say that you can't unpeel it if it is uneven at first. Just don't do it more than once. 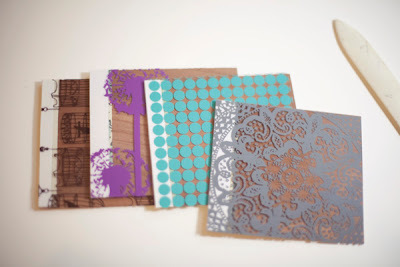 Now you're ready to decorate and personalize! 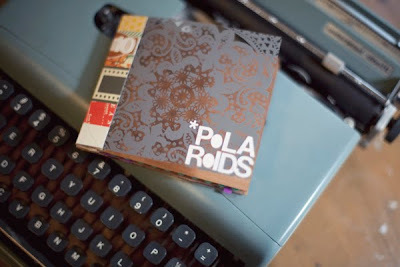 I decided to fill mine with the polaroids I've taken this summer. Voila! I hope that you you'll give this project a try. It's a cool and different way of making a mini rather using our go to metal rings. Please post any questions and I'll be sure to answer them. 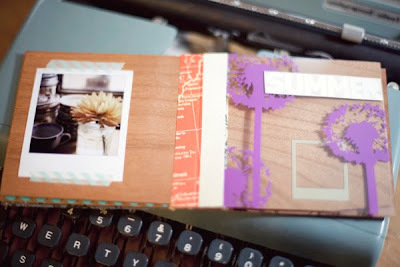 This is such a cool tutorial and mini-book, Tina! Thank you for sharing. 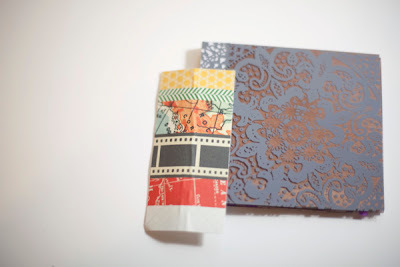 I love how you cut the fabrips so they would show all the different patterns across the binding. cool. You rock Tina I loooove these mini's! This is awesome! I've always wanted to try this ever since last summer when you did that mini. Totally love! this is definitely awesome tina! 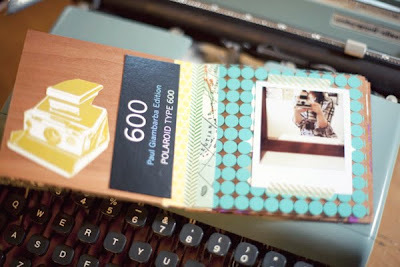 as soon as i get my photos i'm gonna give this a whirl, thanks! What a happy little book! Thanks for sharing Tina! 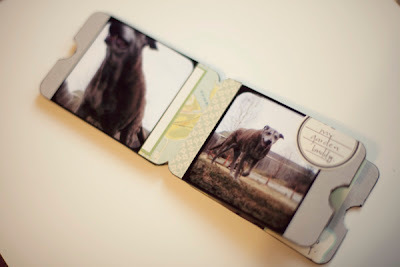 What a cute idea, love new ways to use awsome scrappy products! Very cool!! 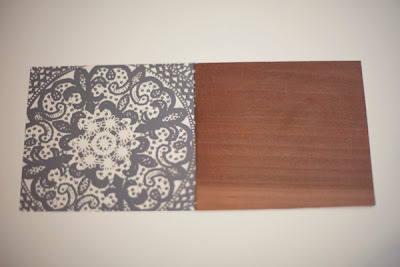 Love this and it gives me a fantastic idea on how to finally use that wood venner! Thank you! Wow, this is a really great one Tina, thanks for sharing it.